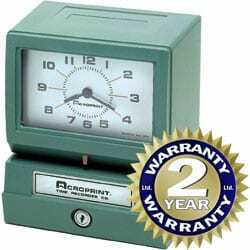 A heavy-duty punch clock such as the Acroprint 150 time clock can handle thousands of print registrations per day. These dependable workhorses feature a tough, rust-resistant case that stands up to harsh environments. They're suitable for any size business. They carry a full lifetime warranty on the typewheel and a 1-year warranty for the rest of the materials.